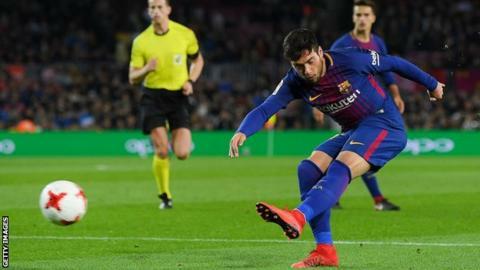 Barcelona reached the Copa del Rey last 16 with a convincing victory over Real Murcia, but there were shock exits for Athletic Bilbao and Real Sociedad. Third-tier Lleida recovered from three goals down to beat La Real, while Formentera knocked out Athletic. La Liga leaders Barcelona, 3-0 up from the first leg, won 5-0 at the Nou Camp with Paco Alcacer scoring the opener. Gerard Pique added a second, and Aleix Vidal, Denis Suarez and substitute Jose Arnaiz completed the rout. There was late drama in Bilbao, as Formentera scored a 96th-minute winner to take the tie 2-1 on aggregate. Alvaro Muniz Cegarra was on target for the Segunda Division B side from the smallest of Spain's Balearic islands. Meanwhile, Lleida trailed Real Sociedad 1-0 after the first leg and were 2-0 down at half-time in the second after goals from Diego Llorente and Juanmi. But their remarkable comeback started when Aitor Nunez scored in the 56th minute, with Manu Molina adding a penalty three minutes later. Bojan Samoukovic netted a third for the minnows three minutes from time to send them through on away goals. The worst way to lose a league title?